Beginning genealogy: Those (not so) pesky neighbors! You’ve started your family genealogy, and zipped right through the first few generations using census records on Ancestry.com. Great! Then the inevitable happens – you hit a brick wall. Great-great-Grandma or Grandpa seems to simply disappear off the face of the Earth! Now what? It’s time to take a closer look at the census records you’ve already used, and look at those nosy neighbors. It’s always worth bearing in mind that census records were compiled by a (sometimes very) fallible human being walking door to door, knocking, and asking “who lives here?”. If you stay aware of this fact, you won’t make the mistake of assuming that because a name is spelled a particular way, in must not be Grandpa Stephen, because he spelled his name with a “v”. If the census taker heard “Gavin”, he might have written “Gavin” on the census. If, on the other hand, he heard “Caffin”, that’s what he’ll write (I’ve seen it happen!). And if the name was even slightly exotic, be it French, German, Italian, Swedish, etc. – forget about it! I am often tempted to believe that to be hired as a Federal census taker prior to 1900, applicants had to pass a grueling exam, where only the most hard-of-hearing, sloppiest penmanship, and poorest spellers passed. I can’t prove this, but I have my suspicions. The other reason it’s worth remembering this door-to-door-knocking fact, is that it means all of the families listed above and below the family you’re researching were next door neighbors. This can be tremendously helpful! For one reason, youthful betrothed tended to marry the guy or girl next door, or a couple of houses down, or the next street over. If you can find great grandpa while he was single in the census records, you can very often find great grandma’s family on the next page or sometimes even living next door. Another reason this is useful is because families during certain periods tended to move in groups. The Johnsons moved from North Carolina to Kentucky to Tennessee with the Smith family, for example. And along the way, sons might marry daughters. You never know how little clues like this might help you break through your brick wall. As an example, I found a house full of my ancestors in the 1880 census, along with a very elderly lady by a different last name of Hollingsworth. Continuing my line yielded a few more results, but I eventually hit the familiar brick wall. This was solved eventually not by researching my family name, but by tracing the Hollingsworths, and looking at their neighbors. And sure enough, I found a family of Hollingsworths living next door to some Gavins in 1850, which filled in the gap I was looking for and allowed me to plow headlong into the next brick wall on the Gavin line. Paying attention to occupations and nationalities of neighbors can also lend some context to the history and kind of location your ancestors were in as well. Was everybody a farmer? This might indicate a poor rural location. Is there evidence for industry? Do you see blacksmiths or railroad workers clustered in the neighborhood? Were the majority of the neighbors German or Irish, or did they speak languages other than English? This might give a clue as to your ancestor’s nationality. What was the average age of people in the community? An extreme lack of elderly individuals might indicate the area was fairly newly established, whereas a uniform lack of young men of certain age might indicate heavy recruitment for a war. Like so much in genealogy, the smallest, most overlooked clues can lead to big breakthroughs with a little patience and diligence. What Is Special Collections, Anyway? If you’ve wandered the library looking for that next great read, you may have braved the stairs and checked out our non-fiction section, teen room, rotunda area, and computer learning lab. As you continued to explore the second floor, perhaps you saw the “Special Collections” signage, beckoning you to a mysterious room tucked back in the corner behind the printers. Special Collections? What is that… a place to donate to your favorite charitable organization? No. Books and periodicals that take you on a journey from European Genealogy and History, to S. Genealogy & History, to Tennessee History & Periodicals. From there, materials explore various Tennessee counties, nearby states, and family biographies. The Local Authors Collection, consisting of books published by Williamson County residents, past and present. A View Scan microfilm reader, which allows you to browse through local microfilm records: newspapers that date back to the early 1800s, court records, deeds, and marriage records. The Epson Perfection Pro scanner, with plastic frame adapters that make it easy to capture crisp digital (and printable) images from 35mm slides, film strips, and variously sized photographs and negatives. A copy stand to help you take well-focused lighted images of publications and objects of all shapes and sizes. Our giant map case, located in the Williamson Room. This five-drawered beauty allows us to store most large maps flat, making them easier for you to find and read. An array of online materials, including free in-library use of Ancestry without a subscription and free in-library Affiliate Access to FamilySearch from your free personal account. The Richard Carlton Fulcher database, which features excerpts of local court records that document persons of African descent in Williamson County from its founding in 1799 until the early 1900s. A database of Williamson County obituaries compiled by library staff and volunteers. Really, there is so much more than I can tell you about here. Are you a Civil War buff or perhaps an aficionado of historic homes? Do you want to dig deeper into your family tree but need some help getting started? Do you need to find an old court record or want to discover where a relative is buried? Perhaps we can help! It is important to note, however, that we are not professional genealogists. We don’t guarantee answers, but we do strive to deliver courteous, professional assistance to help you with your ancestry and local history research needs. Surely there must be a catch? We only have some minor restrictions. To protect our materials, no food or beverages are allowed in Special Collections, and items here are not available for checkout. You may only access our materials during scheduled department hours: from 9 a.m. to 5:30 p.m. Mondays through Saturdays, with extended hours until 8:00 p.m. on Thursdays. The department is closed on Sundays and on scheduled library holidays. Now that you know what Special Collections is all about, why not plan a visit? We look forward to meeting you! 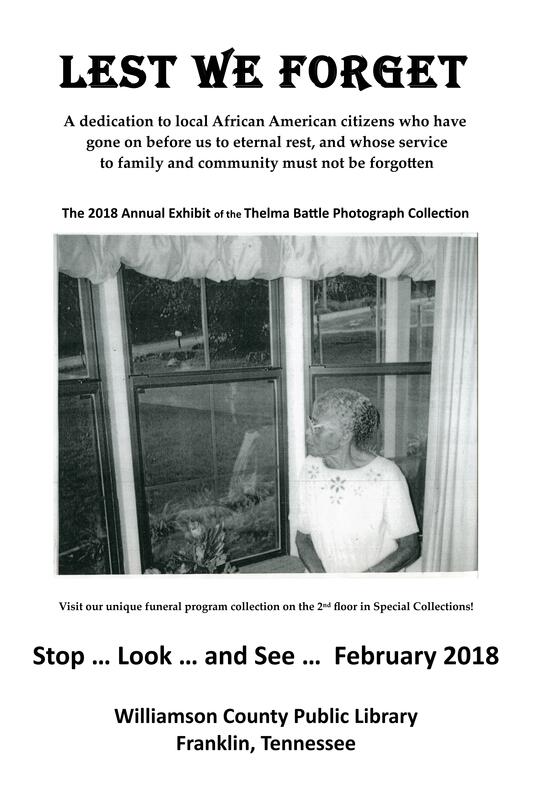 Now, throughout February, the Special Collections department at Williamson County Public Library is hosting the 2018 Thelma Battle Black History Month Photographic Exhibit, “Lest We Forget,” spotlighting the lives of residents in Franklin’s black community who have lived and died in Williamson County. This exhibit features the vast funeral program collection housed in Special Collections as part of the Thelma Battle Family History Collection. Why funeral programs? Oftentimes, we really don’t get to know a person until he or she dies. Have you ever been to a funeral, or read an obituary, and realized there were important things about that person that you didn’t even know? Maybe you weren’t aware of some of the ways he participated in the community, or who his family connections are. This is what makes funeral programs and/or obituaries so valuable. If you’re researching your family history, they’re absolute gold! Obituaries tell us a lot. Things like a person’s full name, his parents’ names, when he was born, who his children and grandchildren are, who predeceased him, who survived him, what he did for a living, when he died, and sometimes why. A funeral program gives you that and more – who preached the service, who the pall bearers and flower bearers were, what scripture was read, which songs were sung. A funeral program can give you the family and friend connections of the deceased. That’s a lot of information to find in one place, and if you’re researching your genealogy, it could give you the very link you need to connect you from one generation to the next on the family tree. We now have over 1200 funeral programs from our local black community in Special Collections, and we’re still collecting. They are filed alphabetically in notebooks, and also digitized in our data files, so they’re available for the cost of a copy, ten cents a page. We are always seeking ways to enlarge our collection and so we invite you to share copies of programs you have that we don’t. If you have family funeral programs or obituaries you can share, we would love for you to bring them in and allow us to copy them and add them to our collection. Talk to one of the librarians in Special Collections to see if you have a program we need. An index of names in our current collection is available to exhibit attendees to search. This year’s photograph exhibit will also include a new oral history film about Ms. Battle’s work as a grassroots historian, “Thelma’s Battle; Preserving African-American History in Franklin, Tennessee.” The film will be available for viewing as part of the exhibit. The exhibit is held on the 2nd floor of the library in the Special Collections department at 1314 Columbia Ave. in Franklin, and will run from Feb. 1st – 28th. There will also be displays in the upstairs and downstairs display cases near the elevators. For more information, call 615/525-1246. Scientists are increasingly looking to nature’s hard drive, DNA, as a potential solution to both the capacity and longevity problems. As our own bodies demonstrate, DNA is an incredibly dense storage medium, potentially squeezing in a mind-boggling 5.5 petabits (125,000 GB) of information per cubic millimeter. By that measure, according to University of Washington professor, Luis Ceze, all 700 exabytes of today’s accessible internet would fit into a space the size of a shoebox. You could then tuck that shoebox away in a vault for thousands of years, and the DNA-stored data would remain intact. Indeed, digital storage modeled on DNA is a promising solution. But until it becomes more than experimental, what should we do in the meantime? For instance, what if you have just been chosen as the archivist for a massive collection of family photographs? How would you choose to store the data? In addition to preserving the actual physical photos, what is the best approach from a digital point of view? After the photos are scanned, what is the best way to store them as digital documents? A helpful answer comes from Denise May Levenick, who inherited her family photo treasures. She shares tips and techniques for preserving a collection in her latest book, How to Archive Family Photos: A step by step guide to organize and share your photos digitally (Family Tree Books: Cincinatti, 2015. In our library nonfiction section under 745.593 May). It is good to keep in mind that, although focusing on photos, the principles she outlines apply to more than photo collections. One important decision for digital material concerns negotiating different file formats. Ms. Levenich explains about using JPG and TIFF files. JPG is a file format that uses compression when saving files and is called a lossy file format because repeated opening and saving of JPG files deteriorates the image quality over time. TIFF is a file format that does not use compression when saving files and is considered a lossless format because it maintains its quality over time. What this means for preservation is that the TIFF lossless format better maintains the digital data than the JPG format, which loses quality with use. One concern with TIFF files, however, is that TIFF is sometimes unreadable by various programs. In this case, our staff librarian photo buff, Rebecca Tischler, recommends saving picture files in PNG. PNG, pronounced “ping,” stands for the Portable Network Graphics format which compresses information in a lossless manner, meaning all the image information is there when the PNG file is decompressed. Further it neither degrades nor loses information with saving, restoring, or resaving like the JPG. Don’t count out the JPG, however, as it has its uses too, one being the JPG can preserve a lot more color than the PNG. Once your format is chosen, it is necessary to back up your photo files. Ms. Levenick recommends the 3-2-1 rule. Denise May Levenick, How to Archive Family Photos: A step by step guide to organize and share your photos digitally (Family Tree Books: Cincinatti, 2015), pp. 108-109; 126. Last Month, we had an interactive display upstairs. Patrons could add their ancestry to a world map and see where some of their neighbors came from as well. Some had many ancestries, and some only had one, but it was interesting to see how diverse our patrons were. And those who didn’t know their background, we pointed them to the Special Collections department, where patrons can get some help doing genealogical research with databases such as Ancestry.com and HeritageQuest. If you want to know more about where your family comes from, ask one of our wonderful Special Collections Librarians for help. But for now, take a look at all the responses that were left at the display. At this library we found out the Hill family from Texas is the Hill family from ESSEX U.K.! People amass stuff. We are all hoarders of one type or another; we just prefer to be called collectors or connoisseurs. We tuck our prized collections away in corners of closets, in attics, in garages and occasionally in storage facilities because we cherish these items. We want to keep them as mementos, memories or keepsakes to show our descendants and maybe have those people love them the same. The question is: are we storing them properly? We want to save these pieces of who we are for the future, but are they going to make it to the future? Libraries have been worrying about this for ages and there are many great places to find information on preserving your collections. Actually, there is too much information out there so here we will pull together the most important as well as the easiest steps for preserving your materials such as books, newspapers, magazines, comic books, film, slides, negatives, magnetic tape (both audio and video), records and even a little on documents and art. Once again, cleanliness is essential. Clean hands, or even archivist gloves, and a clean workspace are ideal for going through your old photographs. Ideally, photos should be stored at 40 degrees or less in a location with 30 to 40% humidity. This is very specific because the stability of modern color photos degrades with heat and according to the preservation department of the Library of Congress, “Relative humidity is the single most important factor in preserving most photographic prints.” Never let adhesives come in contact with photographic prints and only mount them on acid free cardstock. If you are dealing with a photo that has deteriorated or if you are working with an older format like tin or daguerreotypes you will probably want to consult a professional. The American Institute for Conservation of Historic and Artistic Works has an online directory of conservators to help you find one in your area. Film and slides contain cellulose, an organic substance, and as such are subject to decay. Temperature and humidity are mentioned here time and again, but here it is most important. The Association of Moving Image Archivists (AMIA) recommends storage at 40-50° and 20-40% relative humidity. They also suggest freezing film, but this is for long term storage and should be done in the proper manner, starting in a middle to low humidity environment, packaging the material and freezing them for very long term. This is not a thing you want to do if you are planning on getting these items out next week or even next month. These materials are the best case for digital transfer. There are many services out there that can help you get these materials digitized for future use and reproduction. When you are working with magnetic recordings storage should be considered. While demagnetization is unlikely, it can happen so avoid storing your material near large machinery and electrical transformers. Handle reel to reel tapes from the edge and center hole only. Grasping the reel itself to hard can break the reel or crush the delicate tape. Any kind of cassette should only be handled by the outside edges. Do not touch the spools. Store them in a cool place with lower to mid-level humidity. Never mess with the groove. When handling any of these older recordings keep your fingers confined to the label for records, the center hole for CDs, and for the truly old cylinders, just the edges. The grooves are where the recorded material is read by the needle or laser and damage will come from your fingerprints and any dirt on your hands. They should also be stored upright with dividers every six inches to support them in cool dry places. Always allow these materials to reach room temperature in the room where they are to be played before using them if they are stored at a low temperature. Always store like sized material together. Make sure manufacturers cleaning instructions are followed for all playback devices. Most people do not have a Monet in their house or a painting from the Dutch masters in their office waiting room, but with art there is no telling what will become valuable. For forty years the Jesuit house in Dublin, Ireland had a painting hanging in their parlor. In the 1990s it was determined to be a lost Caravaggio. You never know what may come of the paintings on your walls, so it never hurts to take care of them properly. As with every other type of material, cleanliness is the first and easiest step. Make sure that you handle paintings by the sides of the frame, not the painting itself, and have enough people for the job. Dust your paintings with “a clean, soft, natural-hair artists’ brush (3.5cm to 5cm tip)” in one direction if there is no peeling or cracking evident in the paint according to the Smithsonian Institution. Display your art where there is a little exposure to UV light and as little fluctuation in temperature and humidity as possible and avoid extremes in both. Finally, make sure art is hung with the proper hardware and check those hooks, wires and brackets periodically to make sure they are in good condition. Want more information on how to preserve your printed materials? This is a library blog so books come first. The easiest and first step in preservation is careful use. Make sure your hands are clean, that you are reading in a clean area free of food or drink and that you are not forcing the book open to 180°. Never use glues, rubber bands or adhesive tape on books. Never dog ear the pages or mark you place with paperclips or acidic inserts. When storing your books, try to put upright books of similar size together so that they support each other and don’t allow them to lean at an angle. Books should be kept in a cool room with low humidity (<35%) and as little exposure to direct, harsh light as possible. Avoid vents and registers as well as rooms like attics which experience extreme temperature changes. Clean your books and cases regularly. Finally when you remove a book from the shelf, grab the book on both sides of the spine at the midpoint. Do not grab it from the top. Saving the newspaper is a great way to remember a great moment in your, or humanity’s, history. Whether it is a paper from your child’s birth, VE Day, the moon landing or the election of the first African American president, newspapers show a segment of time contemporary to the event. Once again, the rules of cleanliness are paramount. No dirty hands or coffee cups here. Newspapers to be preserved should be opened flat on a surface large enough to support the entire paper. Do not fold the paper against any existing folds. When folding the newspaper back to store it always use the existing folds and keep the edges aligned as much as possible. Newspapers should be stored flat and in protected boxes with some kind of supporting material. Like comics and magazines, these boxes and boards should be acid and lignin free. Storage space should have the same conditions as that needed for books. For the most part the documents that we have now that we want to preserve are those that have already come down to us from generations past. Many of these are already preserved, but even more are not and have already begun to deteriorate. Think about these things and what they are and represent. Discharge papers from the civil war or world war two, your great grandparent’s marriage license, an ancestor’s immigration papers. These are great things to have, but remember that someday, you may be someone’s great grandparent. Now is the time to preserve your documents, before they start to degrade. The basic rules for books still apply to documents (as well as manuscripts, drawings, prints, posters, and maps). In addition, you want to make sure any marks or inscriptions that you make are done in pencil only and on a clean surface to avoid pressing dirt or other contaminants into the paper. Paper items should be stored flat and supported like periodicals, unless the size of the object makes this prohibitive. At that point rolled in an archival tube is the safest storage option. One of the reasons that those Superman, Batman and Captain America comics from the 1930s and 40s are so valuable is that there are not many surviving. Everyone has heard the old, “I’d be a millionaire if my Mom hadn’t thrown away my comic collection” shtick, but this is far from true. These were comics. They cost 10₵, because they were made cheaply. No one expected them to be kept for seventy or eighty years. Modern comics are better, but still need preserving. The rules for books apply here as well, with a little modification. Never bend a comic back upon itself. It weakens the spine and you may be beaten by nerds. Comics should be stored in supportive enclosures. That means polybags, backing boards and archive boxes. You want to make sure the boards and boxes are ph. neutral and lignin free. Otherwise the very things protecting you comics can be causing their slow disintegration. Magazines should be treated in exactly the same way although those with glued bindings (similar to what you see on National Geographic) should be treated like books for the purpose of reading them. Do not open these to a flat position. Want more information on how to preserve your audio and visual materials? Over the past 20 years, since her first exhibit in 1996, Ms. Thelma Battle has displayed over 3000 images in 18 exhibits in observance of Black History Month and in celebration of the culture of Williamson County’s African American community. This year, the Williamson County Public Library hopes to honor her tremendous effort, commitment, and contribution as a grass roots historian. The 130 images on display this year are taken from all of the past exhibits Ms. Battle has compiled. The complete display can be viewed in the downstairs and upstairs display cabinets next to the elevator, and in the Special Collections department on the 2nd floor. Also, in honor of Black History Month, Jane Landers, professor of history at Vanderbilt University, will lecture on her more than twenty years of research on the African Diaspora in various parts of the Americas. Her graduate research on the first free black town in in the Americas (formed by runaways from South Carolina who fled to Spanish Florida) supported archaeological investigations, a National Landmark registry and a museum. Since then she has also worked on diasporic sites in Mexico, Cuba, Colombia and Brazil. Landers now directs an international effort to digitally preserve the oldest records for Africans in the Americas.